Santa Clara Corvettes will host its Annual Corvette Spectacular Car Show on Main Street this Sunday, September 20, 2015 from 8:00 a.m. to 4:00 p.m. The event will feature approximately 165 new, classic and racing Corvettes. In addition, there will be live music, raffle prizes and vendors. *The driveways to each parking plaza will remain open and accessible. Be sure to watch for ‘No Parking Signs’ to avoid citations and vehicle towing. 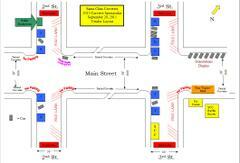 All closed streets will re-open at 6:00 p.m.